Let’s talk about ten other nutrition facts about the avocado that you may not know! 1. Avocados are unlike any other fruit. Have you ever eaten an avocado? Does it smell or taste like fruit to you? No, it doesn’t. It’s kind of a weird fruit, actually. Most fruits are loaded with natural sugars and carbohydrates; avocados are very low in both. While the main draw of most fruits is their sweet and juicy taste, avocados are creamy with almost no hint of sweetness. Beyond this, an avocado has nutritional value unlike any other fruit out there, which we’ll talk about a bit more. 2. Avocados may bolster weight loss. In a study published in Nutrition Journal, researchers found that adding about 1/2 of a fresh Hass avocado increased feelings of fullness (“satiety”) in both overweight and obese participants – over a 3-to-5-hour period! In other words, just half of an avocado was enough to “hold over” the appetites of those who might otherwise snack between meals. Goodbye, cravings! 3. The avocado safeguards your eyes. Containing what are called phytochemicals, avocados provide an effective and potent antioxidant. These antioxidants, spread throughout the eye tissue, can protect the eyes from ultraviolet (UV) light. Additionally, because of their potent nutrient-absorption properties, avocados may also reduce the risk of macular degeneration, the leading cause of blindness in individuals over 55 years of age. 4. Avocado aids nutrient absorption. We must consume adequate nutrients, but we must also be able to absorb those nutrients. Fat-soluble nutrients must be combined with fats – ideally, healthy fats – to be properly utilized by the body. As avocados contain high concentrations of healthy, monosaturated fats, they complement other nutritious foods perfectly. Besides absorbing nutrients, avocado also helps absorb and utilize antioxidants! 5. Avocado improves heart health. Decreases blood triglycerides upwards of 20%. Increases “good” (HDL) cholesterol and decreases “bad” (LDL) cholesterol. 6. Avocados are high in fiber. 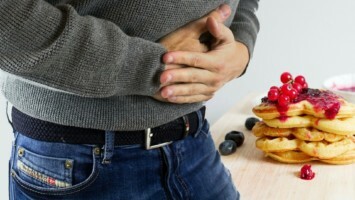 Besides improving digestion, fiber also supports the body in many other ways. It stabilizes blood sugar, promotes healthy gut bacteria, and lowers cholesterol levels. 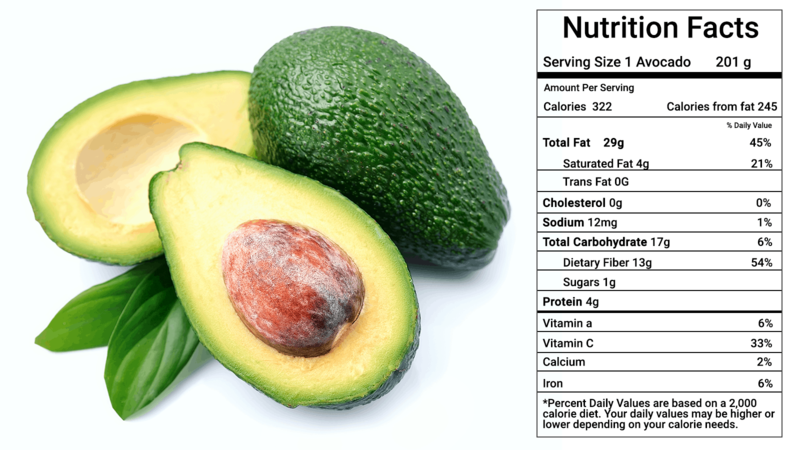 Per the USDA nutritional database, a small Hass avocado contains 10 grams of dietary fiber! Incredible! 7. Avocados have more potassium than bananas. This one may be the most surprising. Not only do avocados outpunch a banana in potassium content, but they also outpunch darn near every other food, period. According to USDA databases, ½ of an avocado contains 487 milligrams (mg) of potassium. One cup of pureed avocado includes a whopping 1,116 mg of potassium! 8. Avocados span the nutritional spectrum. Also making an appearance: vitamin E, A, B1, B2, B3, copper, iron, magnesium, manganese, phosphorous, and zinc. 9. Avocados may fight arthritis. Avocado contains substances called saponins, which are linked to the improvement of arthritis and osteoporosis symptoms. You find saponins in other plant foods, including soy. Researchers are currently studying the potentially enormous benefits of avocado extract on these and similar conditions. 10. Avocados are a legit brain food. 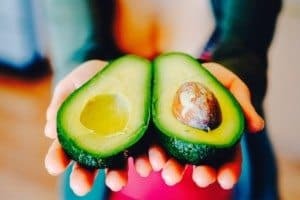 Dr. Daniel Amen, renowned neuroscientist and author of Change Your Brain, Change Your Life, cites avocados as one of the healthiest brain foods in existence. One reason is the fruit’s high concentrations of vitamin K, which is known to neutralize free radicals and inflammation. Numerous studies have shown that vitamin K may reverse the early stage symptoms of Alzheimer’s disease. In this respect, avocados may provide a neuroprotective benefit!